The lure of protein shakes can be strong, even if you’re far from a bodybuilder. Shakes are convenient, portable, nutritious and relatively affordable, but they also have their downsides. 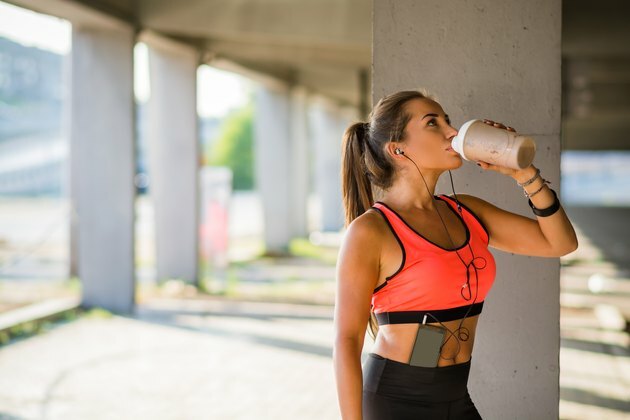 Athletes need more protein than people who aren’t active, so if you aren’t putting in your time at the gym, drinking shakes every day may cause weight gain and other health issues. For bodybuilders and athletes, protein shakes are designed to help build muscle. According to the National Strength and Conditioning Association, consuming a protein and carbohydrate snack or meal within 30 minutes after a workout aids protein synthesis and decreases muscle breakdown. If you don’t work out, however, your muscles aren’t likely to be challenged enough to need that extra protein. Protein contains calories — the same as carbohydrates — and eating too many calories leads to weight gain. If your body can't use the extra calories in protein to aid muscle growth, it stores them as fat. Protein shakes aren't 100 percent protein. Depending on the brand, they may contain many other ingredients to add extra nutrition, and flavoring and sweetness to make them palatable. Those additions can also add calories. A typical whey protein shake contains about 110 calories if you mix it with 1 cup of water. If you mix it with milk or throw in a banana, that number jumps to about 300 calories. Over time, those calories can add up to weight gain, and it’s likely to be in the form of fat rather than muscle if you’re not regularly exercising. Protein shakes are dietary supplements and typically are produced with isolated nutrients rather than whole foods. If you’re supplementing a healthy, well-rounded diet and fitness plan, that may not matter, but if you’re replacing regular meals with protein shakes, you may be missing out on valuable nutrients. According to the M.D. Anderson Cancer Center website, dietary supplements like protein shakes are unable to successfully reproduce the phytonutrients, antioxidants, fiber and other protective substances that whole foods naturally contain. Many brands of protein shakes contain other substances that aren't good for you, including artificial flavors and sugars. For that reason, it’s a healthier choice to eat natural, high-protein foods instead of drinking shakes. Your kidneys are tasked with the process of metabolizing excess protein. If you consistently consume more than you need, that strain can result in serious health problems. According to the Physicians Committee for Responsible Medicine, most Americans get more protein than they need, even without supplements like shakes. If you keep your protein intake higher than necessary for an extended period of time, you may increase your risk of kidney stones, osteoporosis, kidney disease or even cancer. Before you add shakes to your diet or make any major changes to your eating plan, see your doctor. Protein is an important nutrient for everyone — not just athletes. Protein is the building block of life, responsible for healing injured tissues, synthesizing hormones, and strong hair, skin and nails. It's important that your diet contain enough protein — but not too much. The average sedentary adult needs only .4 grams of protein per pound of body weight per day. For an adult weighing 155 pounds, thats 62 grams of protein per day. Protein is present in almost all foods and is found in high amounts in fish, chicken, lean beef, eggs, dairy and legumes. As long as you eat a wide variety of nutritious foods each day, you'll be able to get all the protein you need from your diet.